UltraCard is a high quality video grade PVC card stock with a polished scratch- and debris-reduced surface. A special laminate is bonded to the card during the manufacturing process to improve dye receptivity and increase card life. 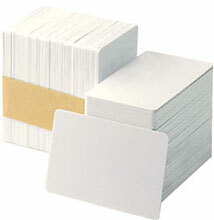 The card's solid PVC design provides high image quality and medium flexibility and temperature durability. Durability for a card with a standard credit card thickness (30 mil) is estimated at 24 months or 3000 cycles or swipes through a test card reader. The card will start to bend or warp at about 130 degrees F-- the temperature that your closed car can quickly reach on a hot summer day! The Fargo 81754 is also known as Fargo Electronics	FGO-81754	.